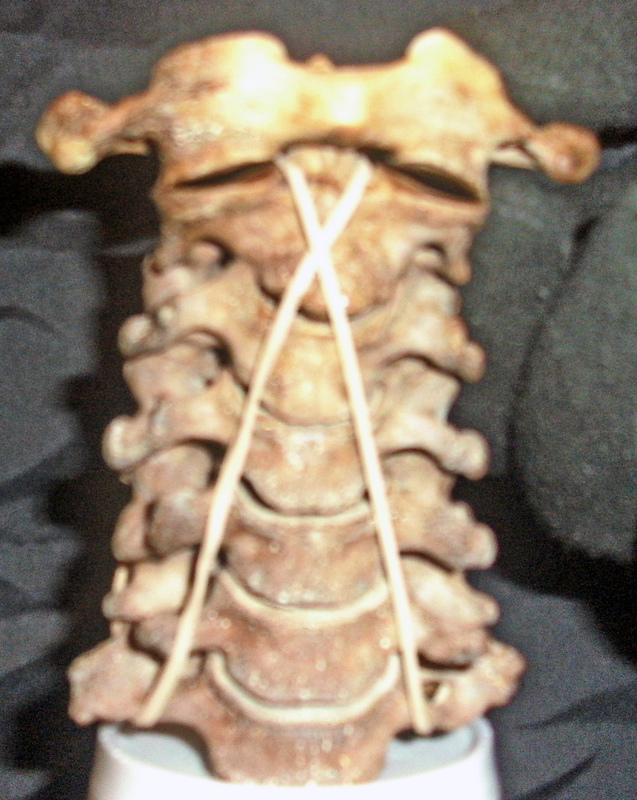 Exhibit "A" is a "virgin" X-ray of the female victims cervical vertebrae C1 - C7. This X-ray was taken while the female victim was still in the body bag and before any physical examination of the corpse took place. Exhibit "B" is an actual photograph of the C1- C7 vertebrae that was produced and given to the victims family after the physical examination took place and after all captioned remains were examined by the ISP (Illinois State Police) Crime Lab. Note that the alignment/ articuation of the C1 and C2 facits indicated by red arrows in Exhibit "A" are remarkably different than the alignment/articulation of the C1 and C2 facits indicated by red arrows in Exhibit "B". 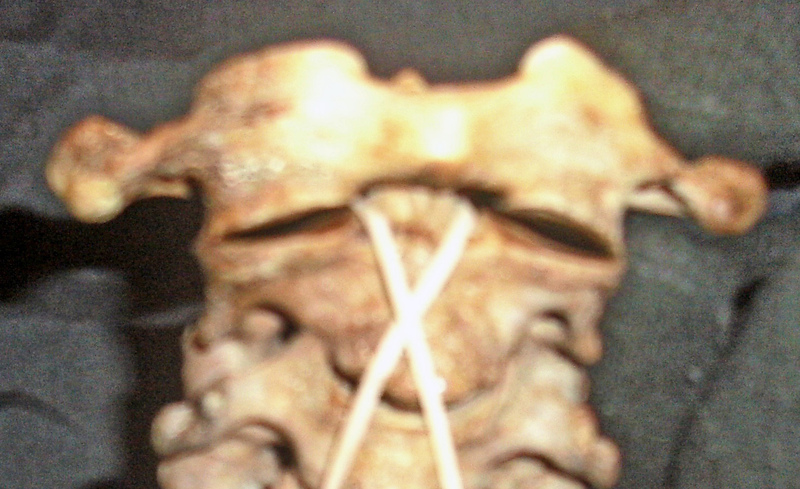 Note that the "virgin" X-ray image in exhibit "A1" to the human eye indicates that the bone matter in the C1 vertebrae between the right and left facits is missing or broken out, as indicated by the red arrows. Likewise note that the bone matter in exhibit "B1" between the red arrows is completely intact. Exhibit "C" is a "virgin" X-ray of the victims' left upper rib cage. Note that the red arrows in exhibit "C" appear to indicate trauma (fractures) to two of the ribs in the victims' upper left rib cage. Note in X-ray exhibit "C1" as indicated by the red arrows, that an anomaly exists in the upper left rib cage that appears to be a foreign object, or the cavity of where a foreign object once came to rest. Note in exhibit "D" as highlighted, that the Ogle County Coroner in 1948, (Fred Horner) reported to the press that "the girl had been shot in the upper left chest area." 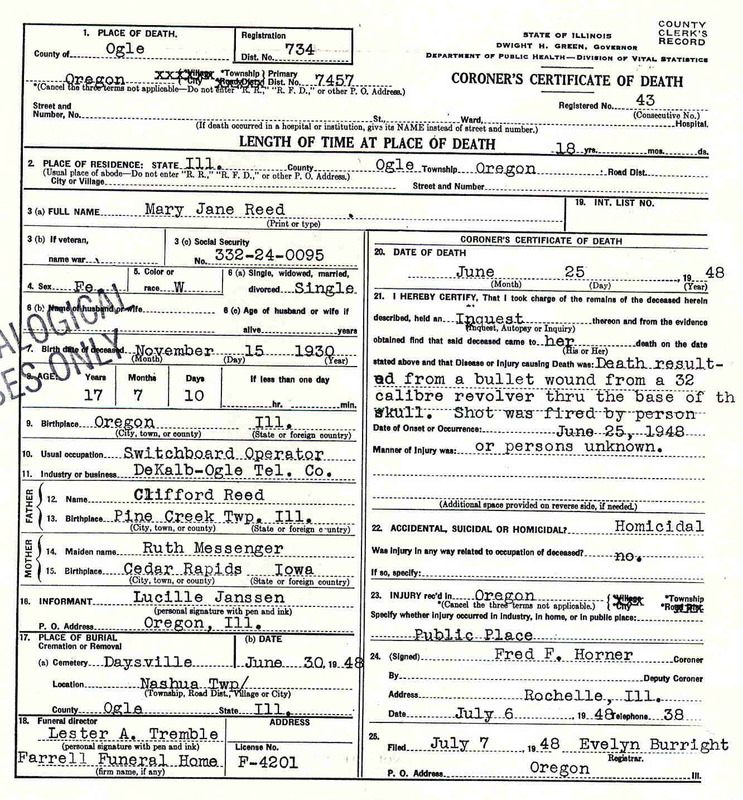 Note in exhibit "E", below, a true and correct copy of the Death Certificate of Mary Jane Reed, the female victim. As indicated by the red arrow, that Ogle County Coroner Fred Horner never signed the Death Certificate of the female victim. 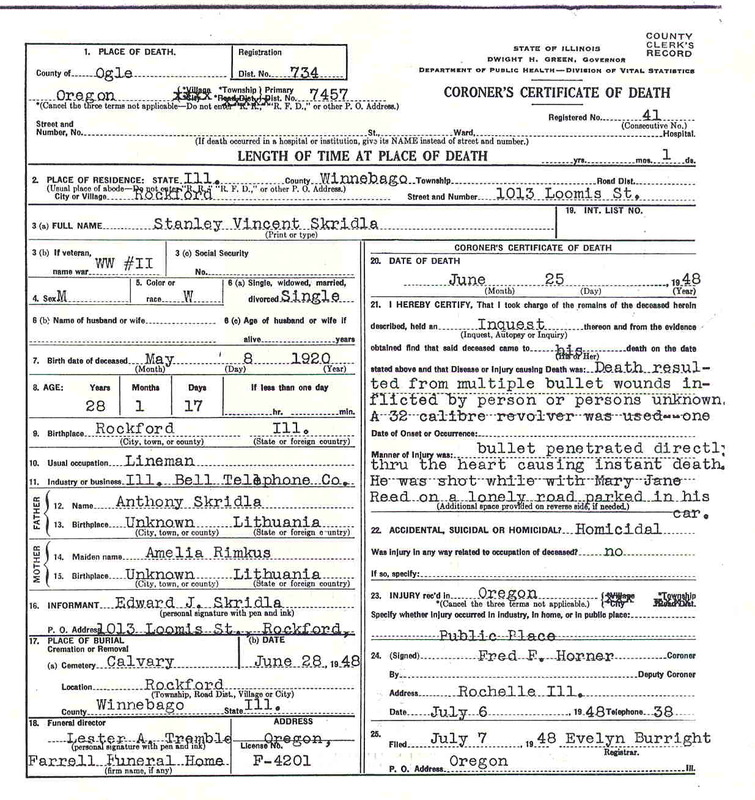 Note in exhibit "F", below, a true and correct copy of the Death Certificate of Stanley Vincent Skridla, the male victim. As indicated by the red arrow, that Ogle County Coroner Fred Horner never signed the Death Certificate of the female victim.